Claudio Ranieri made one change to his side with Mahrez in for Okazaki and they enjoyed a fine opening spell that had Palace on the back foot. In the 8th minute Albrighton cut in from the right and hit the inside of the far post with a shot across goal. The rebound fell for Mahrez who stroked it a foot wide of the same post. Mahrez then tested Hennessey with a 20-yarder before Kanté fired over from the edge of the box. Drinkwater struck a decent half-volley from distance but Hennessey was right behind it. Palace then had a rare sortie upfield but good work from Morgan and Huth prevented Bolasie from feeding a ball to Campbell in a dangerous position. The game then settled down with Palace sitting deep to snuff out City’s counter-attacking game and a Schmeichel save from Cabaye ensured a goalless scoreline at the break. The second half saw a hard-fought battle all over the pitch and chances were few. Schlupp sent an effort narrowly wide, but then City pounced on an error to break the deadlock on the hour. 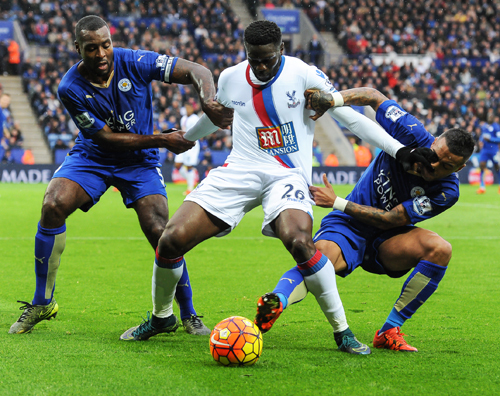 Hangeland’s misdirected pass out of defence fell for Mahrez, who sent Vardy through on goal. Vardy, under pressure from a defender and with the keeper racing out to meet him, showed great presence of mind to lift the ball over Hennessey before smashing it home from close range. 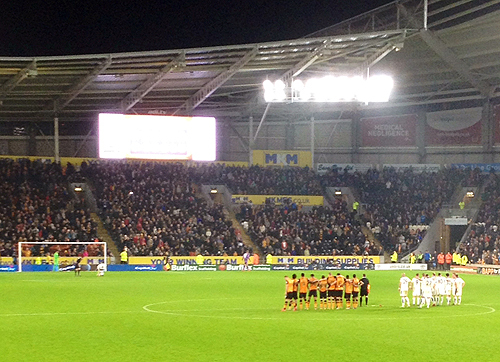 A huge roar greeted this goal, partly in acknowledgement of how tough a game this was. Palace, now forced onto the offensive, looked threatening for a long spell. Schmeichel made a save from Sako and then it was all hands on deck for a while as the City keeper made a good save from Bamford and Fuchs headed Dann’s effort away from under the bar. City weathered this late storm, aided by Ranieri whipping the crowd into a frenzy as the game entered four minutes of injury time, to claim all three points. Jamie Vardy joined an exclusive club of players who have scored in 7 consective Premier League games, while City opened up a four point gap on sixth place. Leicester: Schmeichel, Simpson, Huth, Morgan, Fuchs, Albrighton (Okazaki 63), Kanté, Drinkwater, Schlupp, Mahrez (Dyer 79), Vardy. Subs Not Used: De Laet, King, Kramarić, Schwarzer, Inler. Palace: Hennessey, Mariappa (Jedinak 76), Hangeland, Dann, Kelly, Cabaye, , Bolasie, McArthur, Puncheon (Zaha 68), Campbell (Bamford 57), Sako. Subs Not Used: Speroni, Mutch, Delaney, Ledley. Referee: Mike Dean. Attendance: 31,752. 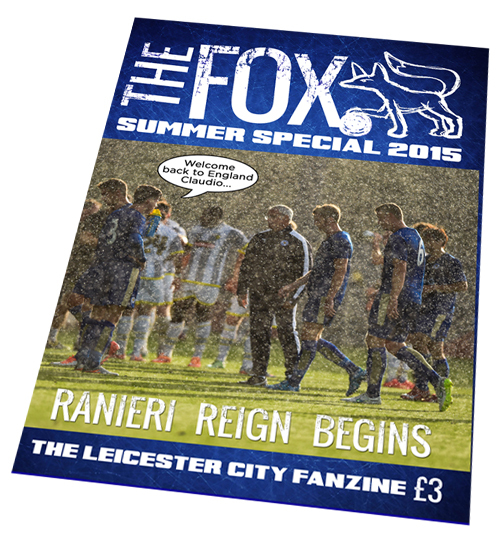 Get your Summer Special and FOX 195 delivered to your door by return of post, followed by the rest of this season’s issues as they come out. 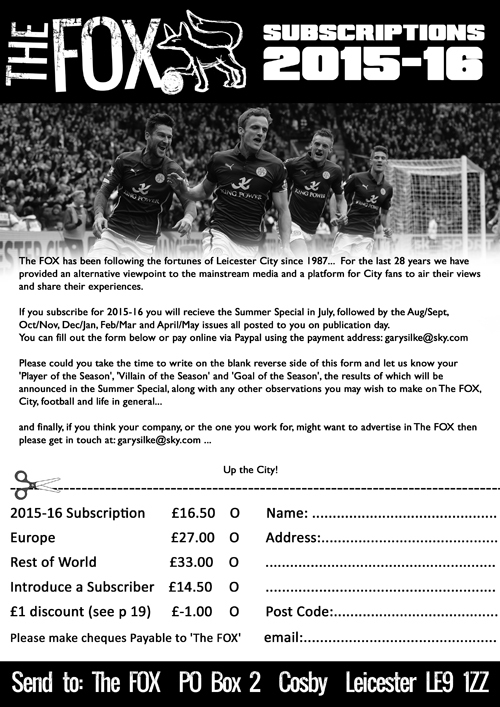 The FOX 195 – The Leicester City Fanzine – Out Now! 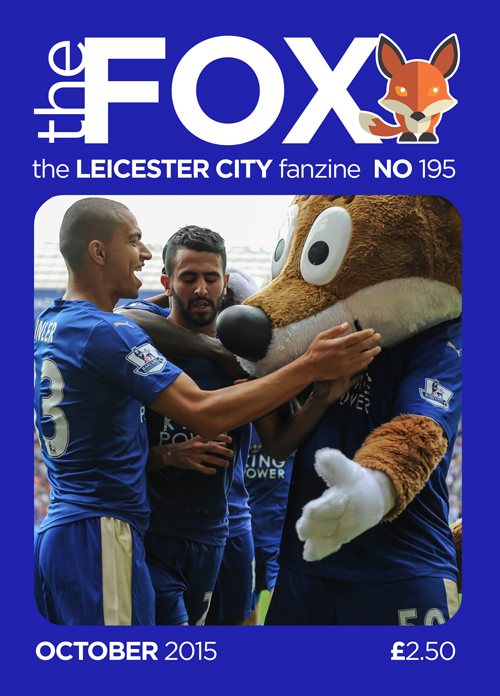 The FOX 195 is in the shops now and will be on sale before tomorrow’s game against Crystal Palace. 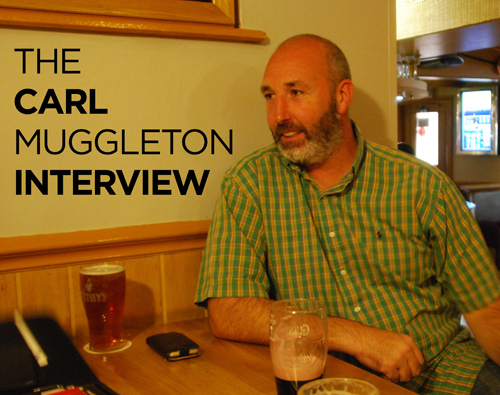 Featuring: An interview with former-City goalkeeper Carl Muggleton; Fully Programmed from 1996-97; Fox Diary with not a defeat in sight; the latest from the Foxes Trust; What’s happening on #lcfc Twitter, starring Christian Fuchs; Rewind goes back to 91-92; Foxed in the Head – travels to Highbury, Norwich, a mystery church and the Odeon Cinema in 1973; Michael Rayns is our guest columnist; John Hutchinson continues his series on City and World War II; your letters and Bentley’s Roof; Parting Shots our favourite photos of the last month; and Frank has a Cockernee knees-up…. FOX: At what stage did you suspect that you would actually make it in the game? CM: Well, funnily enough I think I realised when I got injured and had to have a cartilage operation when I was 15. John McVey was the physio at the time, and I had to go and see him and the club arranged for me to have the op and really looked after me. I thought, well they are looking after me well, they obviously want me. They the club arranged for me to have one day a week at Belvoir Drive under goalkeeping coach Alan Hodgkinson, I had to drop a subject at school to fit it in. I was sort of an apprentice for a day so I’d have to do some jobs but then I would join in with the goalkeepers, Mark Wallington, Ian Andrews, Jerry Roberts. It was absolutely fantastic, sometimes I’d get to join in with the 5-a-sides with the first team players… Alan Smith, Gary Lineker. You didn’t get fed at Belvoir Drive in those days so we would end up catching a bus into town with Andy Feeley, have a sandwich and then eventually make my way back home and try and catch up with all the homework I hadn’t done. After a year of that I was told I had got an apprenticeship, so it was head down and get on with the football after that. Claudio Ranieri started with the same eleven that did so well at Norwich but with surprisingly no space on the bench for Ulloa. 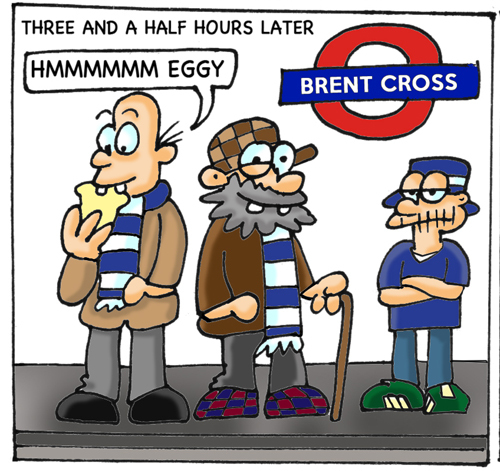 City fans were in buoyant mood before the game with many obviously taking advantage of the early departure to maximise drinking time. Vardy had a good chance to open the scoring on 4 minutes after being set up by Albrighton, however it was City who looked distinctly hungover after the international break which allowed an excellent Saints’ side to take control of proceedings, with only Danny Simpson for Leicester looking up to speed. Southampton duly took the lead on 21 minutes when a simple near post corner was diverted into the net by Fonte, through a static defence and in off the unguarded far post which left the City players asking each another what had happened. City did push up immediately after the restart with headers from Okazaki and Morgan being saved but City looked distinctly off edge and 16 minutes later the home team doubled their lead albeit from an offside goal. Schmeichel pulled of a fine save to deny Mane but again from the resulting corner, van Dijk, who had come from an offside position, had acres of space and time tap the ball home from two yards after twice rebounding from the the post. City almost got one back before half time but Huth could not find the net from close range shortly after Drinkwater had a good shot saved by Davis in the Saints’ goal. City came out of the tunnel for the second-half looking a different team with the additions of Mahrez and Dyer for Schlupp, who had suffered a nasty cut in an earlier clash of heads, and Okazaki, who is beginning to look of a shadow of his early season promise. Vardy shot directly at the keeper on 49 minutes and Mahrez produced one of his curling efforts that was narrowly wide on 61 minutes but five minutes later City pulled one back from Vardy. An excellent run down the right-flank and cross by Dyer was superbly headed home at the near-post by England’s number nine for his eighth goal of the season and tenth in ten games. Now it was all Leicester, who were camped in the Southampton half with the outstanding Kante, who would not look out of place in the Champions League, running the show in midfield and Vardy and Mahrez causing chaos up front. Vardy almost got a second with a delightful move started by a sublime Mahrez back heel. One Frenchman then set up another for what should have been the equaliser when Kante set up Mahrez, but his shot grazed the crossbar. The equaliser had to come and in the first minute of injury time it did, and it had to be Vardy, to cue wild celebrations from the players in front of delirious City fans who had just witnessed another amazing turnaround from the comeback kings. If his first was a sweet header, his second, with his right foot, was just as delicious with a shot into the roof of the net, the result of a fine move again featuring Dyer and Mahrez, who now has the most assists in the Premier League. There were still four minutes to go and City went for the winner and almost got it with Huth sending a shot high and wide from a set-piece. But, alas, miracles don’t happen every week and City had to settle for a point. In the post match interviews both managers praised Leicester’s never-say-die attitude and excellent team spirit, but the last word has to go to England’s leading marksman who lauded Ranieri’s half-time substitutions which allowed his prolific goalscoring form to continue and cement his name as an all-time City great. Southampton: K. Davis, Cédric (Yoshida 60), Fonte, van Dijk, Bertrand, Wanyama, Ward-Prowse, S. Davis (Clasie 60), Tadić (Rodriguez 75), Mané, Pellè. Subs Not Used: Gazzaniga, Romeu, Juanmi, Caulker. Leicester: Schmeichel, Simpson, Huth, Morgan, Fuchs, Albrighton, Drinkwater, Kanté, Schlupp (Dyer 46), Okazaki (Mahrez 46), Vardy. Subs Not Used: De Laet, King, Benalouane, Schwarzer, Inler. Referee: Mr. P. Tierney. Attendance: 31,559. Match report and photo: Rob Coe. Claudio Ranieri made two changes to his side with Fuchs and Simpson at left and right back, and Schlupp moved forward, meaning one of the Premier League’s best performers, Riyad Mahrez, was dropped. It was brave, and it paid off. Norwich, playing in front of a record all-seated attendance at Carrow Road, had the first chance which Jerome sent over the bar. A good move involving Drinkwater and Albrighton created City’s first opportunity but Okazaki’s header was off-target. 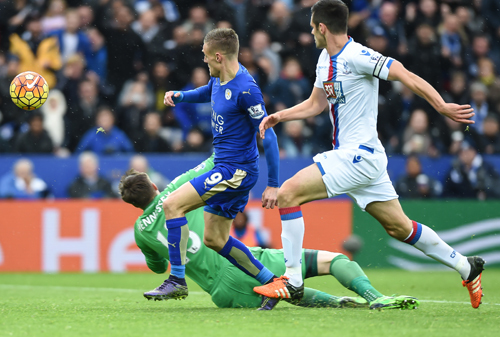 Vardy then found the side-netting with an angled drive, but didn’t have long to wait for his first goal. In the 26th minute Vardy’s raw pace saw him get ahead of Bassong as they chased a Kanté pass and the defender couldn’t apply the brakes in time to stop himself bringing the England striker down. 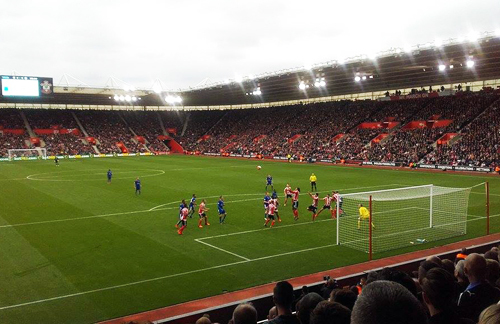 Vardy crashed the spot-kick home himself to the delight of the travelling fans, his 7th goal of the season. Schlupp was then inches away from extending City’s lead moments later, but couldn’t quite reach Albrighton’s cross. Tettey then made a vital interception to deny Okazaki as City enjoyed a very good spell up to the break. Norwich started the second half in determined fashion, putting Schmeichel’s goal under pressure with a series of high balls, but after a couple of minutes of this City broke rapidly to make it 2-0. 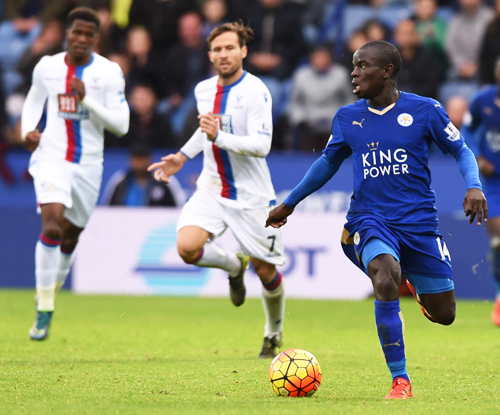 Schlupp charged down the left and played off Kanté before drilling the ball past Ruddy with a cleverly delayed shot. 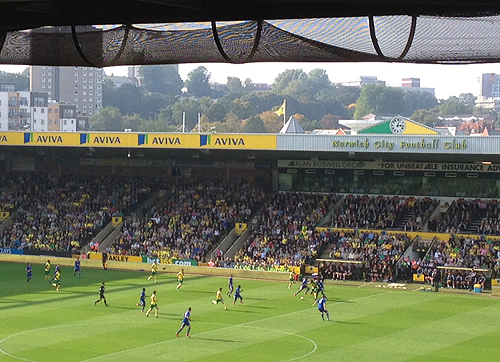 Benalouane then replaced cramp victim Simpson, while Norwich increased their presence up front with the introduction of Mbokani, who soon planted a header against the bar. In the 68th minute Mbokani sprang the offside trap to head a Brady ball, unmarked, past Schmeichel to set up an uncomfortable closing twenty minutes for the visitors. Ulloa replaced Okazaki and soon found the net with a header, but his joyful celebrations in front of the Leicester fans were cut short by the ref’s whistle, Clattenburg having spotted an earlier Huth shove. So it was a nail-biting closing period, made worse when Vardy appeared to have jarred his knee, but he carried on after some treatment and then fired an effort just wide (causing outrage among the home fans). Despite plenty of pressure, City saw out 6 minutes of time added on to claim a fine victory and return to the top four. Norwich: Ruddy, Whittaker, Martin, Bassong, Howson, Jerome (Lafferty 77), Brady, Hoolahan, Jarvis (Mbokani 59), Dorrans (Redmond 50), Tettey. Subs Not Used: Rudd, Olsson, Bennett, O’Neil. Leicester: Schmeichel, Drinkwater, Morgan, Huth, Vardy, Albrighton, Kante, Schlupp (King 77), Simpson (Benalouane 65), Okazaki (Ulloa 70), Fuchs. Subs Not Used: Schwarzer, De Laet, Mahrez, Inler. Referee: M Clattenburg. Attendance: 27,067. Europe £27 – click HERE to pay via Paypal. Rest of the World outside Europe £33 – click HERE to pay via Paypal. 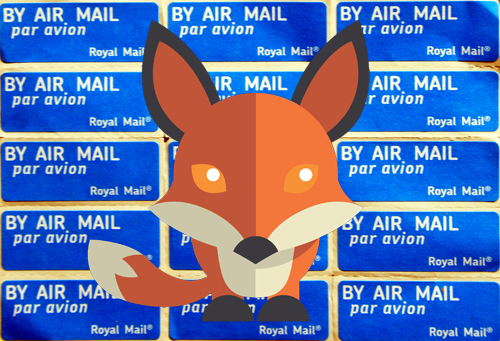 Your copy of The Fox Summer Special will posted straight out to you. We currently have satisfied customers in the USA, South Africa, Sweden, Holland, Australia, Japan, New Zealand, Germany, France, Spain, Canada and Luxembourg. Let’s turn the globe royal blue.